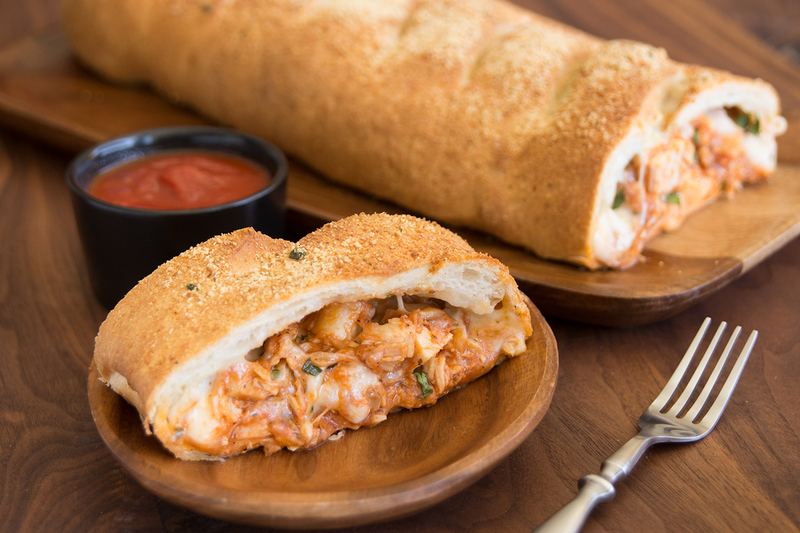 Another delicious Stromboli your family will love. Spray counter lightly with cooking spray. Combine rolls and roll into an 18×12 inch rectangle. Cover with plastic wrap and let rest while preparing the rest of the ingredients. Combine chicken and marinara sauce and mix well. Mix together 1/2 cup Parmesan cheese, salt, pepper, garlic and onion powders and Italian seasoning. Sprinkle over chicken and mix well. Add fresh basil. Remove plastic wrap from dough. Lay 4 slices of provolone cheese down the long center of the dough leaving 1 inch uncovered at each short end. Place chicken mixture on top of cheese. Put the last 4 slices of cheese over the chicken mixture. Fold one long side of the dough over the center mixture. Lift the other long side over the first and press to seal. Lift the stromboli onto sprayed baking sheet and turn ends under. Brush with melted butter. Sprinkle remaining tablespoon Parmesan cheese over butter. Make shallow diagonal cuts along the top of the stromboli. Cover with sprayed plastic wrap and let rise 30-45 minutes. Remove wrap and bake at 375 degrees F 20 minutes. Cover with foil and bake an additional 20 minutes. Serve with extra marinara sauce for dipping.